Charles Fishburne is a correspondent for WCVE Public Radio. He brings over 40 years experience as a broadcast journalist and news executive in Richmond, Washington D.C. and New York. Charles was also a long-time television news anchor and news director in Richmond. Henrico County’s longest serving-employee has been honored by the Board of Supervisors, his family and friends, as he celebrated 73 years on the job this week. Charles Fishburne reports. The Henrico County Board of Supervisors has unanimously adopted a 918.7 million dollar general fund budget for the fiscal year starting July 1. For the first time in the United States, drone delivery to homes is about to become a reality. The FAA has just certified the Google sister company Wing, allowing it to launch package delivery in Southwest Virginia. The U.S. Weather Service says at least 15 tornadoes hit Virginia Friday, ranking it as having the third highest number of tornadoes in a single day . A former UVA football player facing a second trial on charges he scammed victims out of nine million dollars wants a different judge this time around. The National Weather service this morning has upgraded the risk factor for severe weather for a large area of central Virginia, especially south of Richmond. 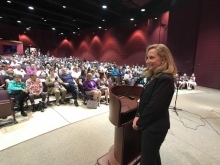 As Washington scrambles to unravel the Mueller report, Seventh District freshman Democratic Congresswoman Abigail Spanberger came home to Henrico last night for a town hall meeting, to answer questions about the report and other issues on constituent’s minds. It was a flawless launch late yesterday of an Antares rocket from Wallops Flight Center to the International Space Station, with 7600 pounds of supplies, 40 mice, two robots and 63 miniature student satellites. 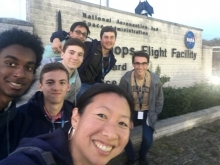 An Antares rocket blasted off on schedule from the Mid-Atlantic Regional Spaceport this afternoon, en route to the International Space Station, with supplies and with working satellites, built by Virginia Students. 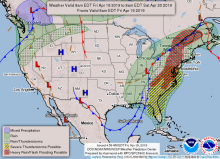 The National Weather service is keeping track of a potentially severe storm system expected for much of south and southeast Virginia Friday. Charles Fishburne has an update.